I’ve recently gone back to an old workplace, this time not as an employee but instead on an elective placement. It’s been quite interesting seeing how things run from another point of view and realising how little things have changed over the years. While there have been some staff changes, most of the old team are still there and still as lovely as ever. 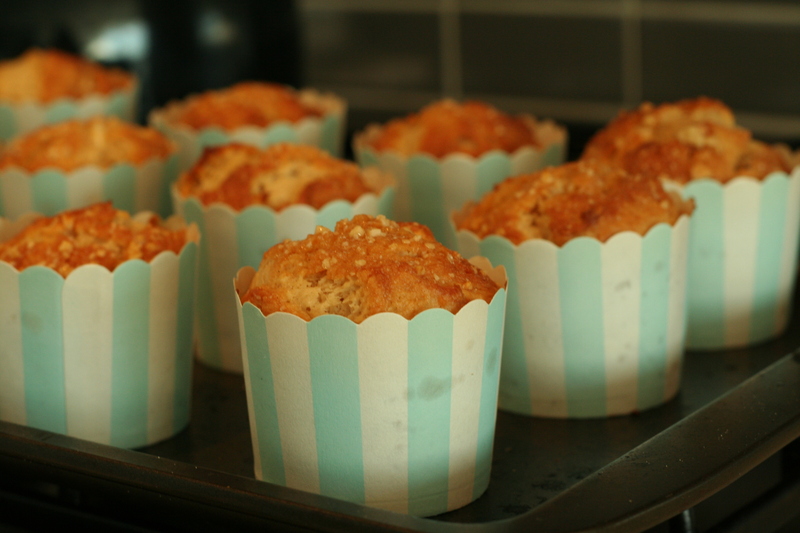 I made these muffins as a think you to them for welcoming me back so readily. They didn’t last long. 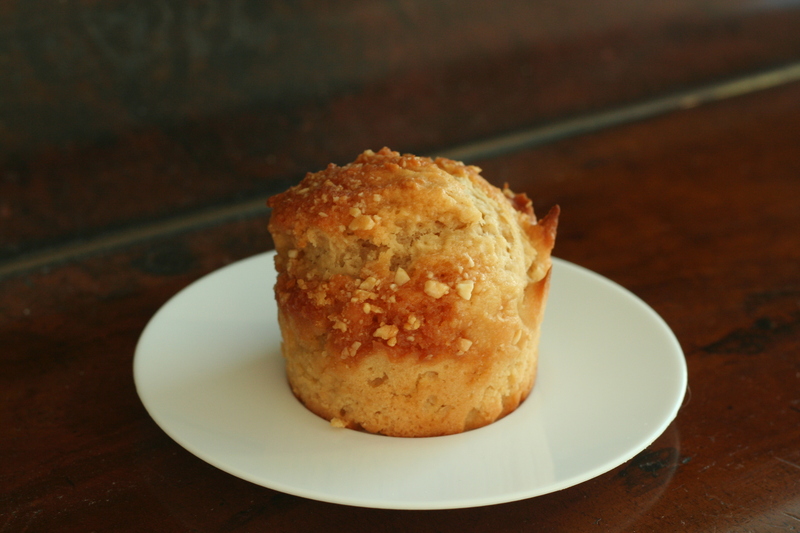 These muffins bring together some of my absolute favourite flavours: butterscotch, caramel and white chocolate. They’re moist and dense and kept soft by the sour cream. The chunks of white chocolate provide little bursts of sweetness and the praline topping is deliciously crunchy. It’s a little extra that you could choose to omit but it does add another dimension to the muffins. Overall they are delicious but there are a couple of small changes I would make next time around. Firstly I would increase the amount of white chocolate to 1/3 of a cup and also increase the sour cream to 250g to give a slightly wetter batter. The praline is fantastic but I think next time I will break the caramel up into shards rather than process into powder to give extra crunch and toast the almonds before adding them to the caramel. You will end up with extra praline and this can be stored in an airtight container until you find another use for it. 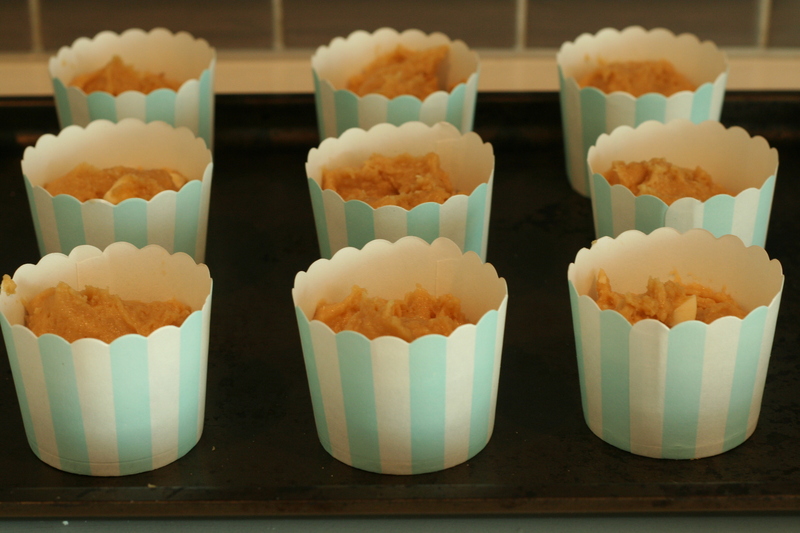 Preheat your oven to 180° and prepare muffin cups or tins. Sift flour and baking powder into large bowl and add brown sugar. In a separate bowl combine melted butter, buttermilk, sour cream, vanilla and egg and whisk together. Add to flour mixture and stir to combine. Stir through the white chocolate. 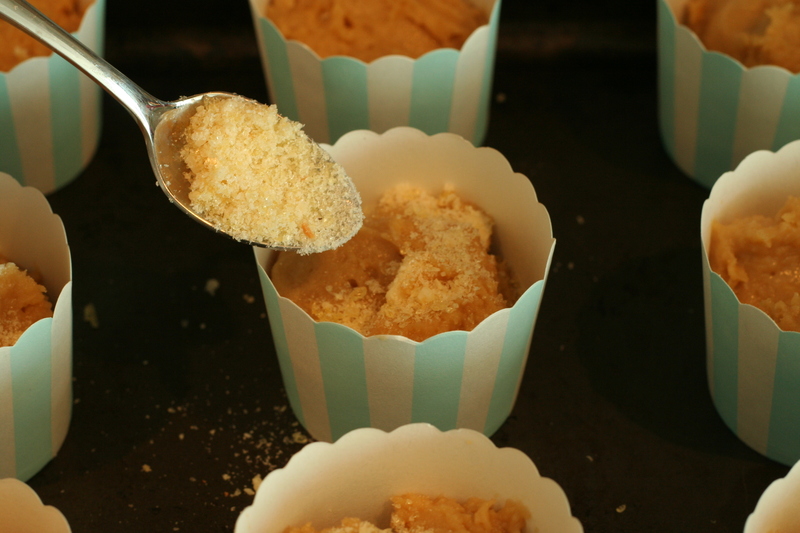 Spoon batter into muffin cups/tins and sprinkle praline over the top. Bake for 20-25 minutes or until golden and a skewer inserted into the centre comes out clean. In a small saucepan combine sugar and water. Heat over medium heat until sugar dissolves then increase to high and bring to a boil. Do not stir. Allow to boil until the colour changes to caramel then remove from heat. 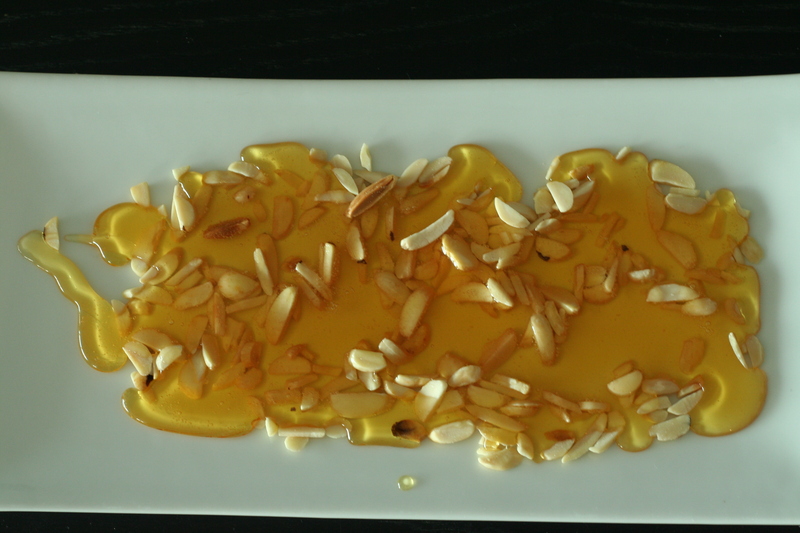 Spread almonds out on a tray then pour over caramel and allow to set. Break up the praline and whiz in a food processor to get crumbs. Keep extra praline stored in an airtight container. pretty:-) And what a fantastic flavor combo. Butterscotch, pralines, and white chocolate chunks?? Ooooo I wish I could bite into my screen. 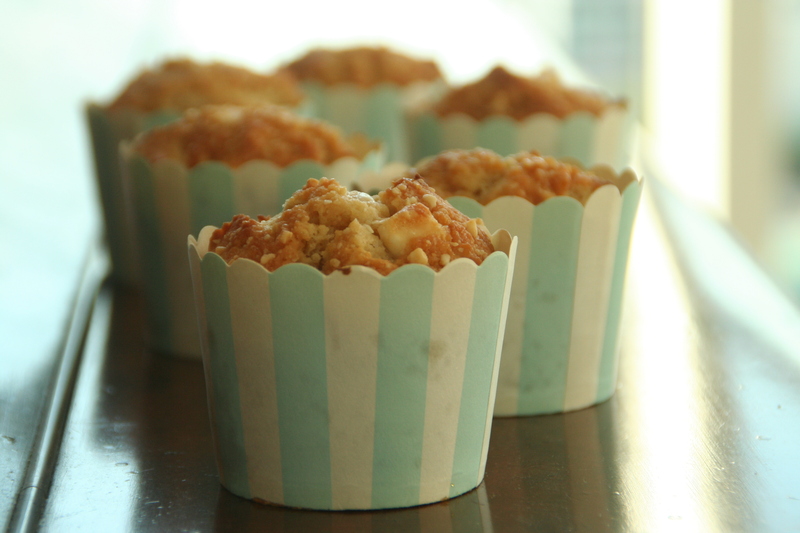 I also love your muffin cups! Did you make those yourself? No I didn’t, I get them from a market in Melbourne but you can find them in specialty cake shops too. Hahah I was just admiring (like another reader) your yellow polka dot ones too from another post, and answered my question! Haha You must get asked this same question a lot! 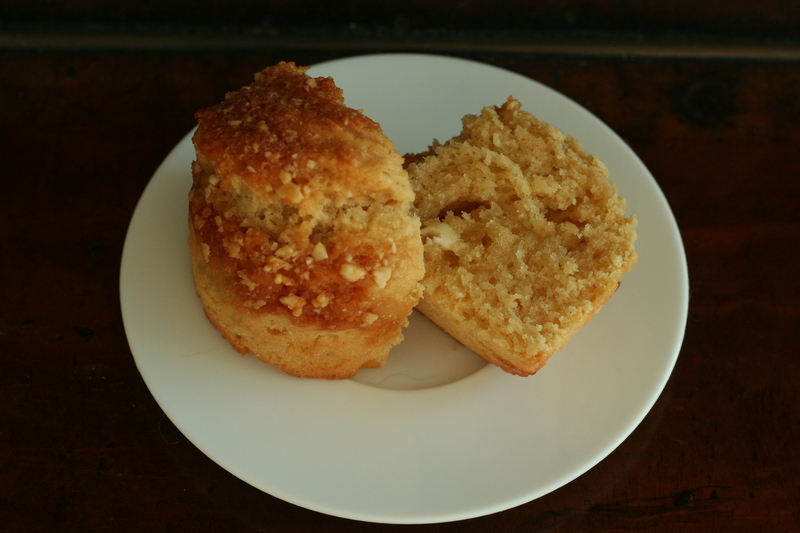 I make muffins all the time, but these are unlike anything I’ve made before. They are so unique and look wonderful! These muffins look delicious! I love your wrappers as well!